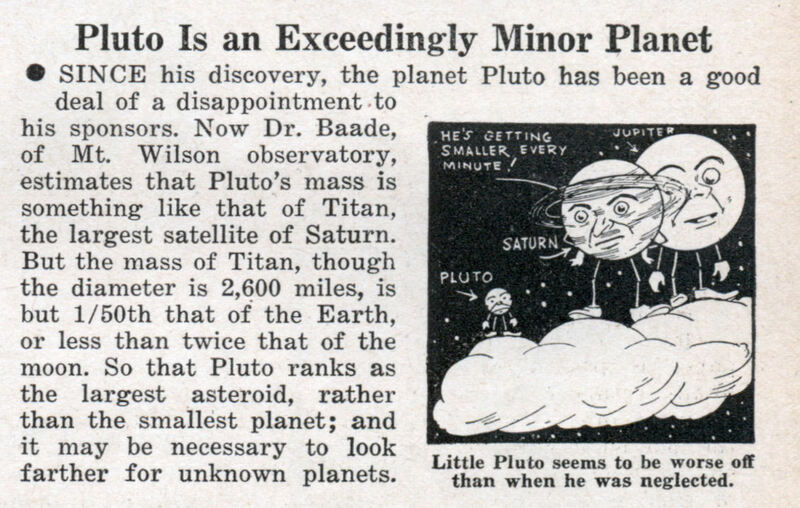 Aparently Pluto’s status as a planet has been in doubt from the very beginning. SINCE his discovery, the planet Pluto has been a good deal of a disappointment to his sponsors. Now Dr. Baade, of Mt. Wilson observatory, estimates that Pluto’s mass is something like that of Titan, the largest satellite of Saturn. But the mass of Titan, though the diameter is 2,600 miles, is but l/50th that of the Earth, or less than twice that of the moon. So that Pluto ranks as the largest asteroid, rather than the smallest planet; and it may be necessary to look farther for unknown planets.